Thousands of years ago migrants from South China began the journey that took their descendants through the Pacific to the southernmost islands of Polynesia. 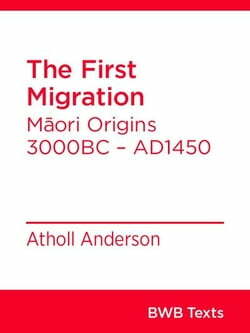 Atholl Anderson’s ground-breaking synthesis of research and tradition charts this epic journey of New Zealand’s first human... read more inhabitants.Taken from the multi-award-winning Tangata Whenua: An Illustrated History this Text weaves together evidence from numerous sources: oral traditions, archaeology, genetics, linguistics, ethnography, historical observations, palaeoecology, climate change and more. The result is to people the ancient past: to offer readers a sense of the lives of Māori ancestors as they voyaged through centuries toward the South Pacific.